Yusuf Olaolu Ali SAN | Senior Advcate Of Nigeria. 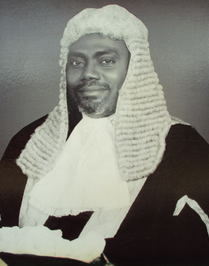 Yusuf Ali Esq. ; SAN started his early life by been enrolled in a local Quranic school and in a formal school in 1960. After his primary education, he went to a secondary modern school for three years, he worked briefly before he gained admission to Ibadan Boys High School, Ibadan, where he passed his school certificate with grade one. He was the labour prefect . He again worked briefly as a clerical officer in the old Oyo state Ministry of Finance as a tax officer posted to Igboora in 1977. He gained admission to the University of Ife, now (Obafemi Awolowo University, Ile-Ife) in 1978 and graduated with a 2nd Class Upper Division for his Bachelor of Laws degree. He attained the highest professional honor at the Nigerian Bar in 1997, when he was conferred with the prestigious and honorable title of Senior Advocate of Nigeria , S.A.N. Yusuf Ali has been in active legal practice for over three decades. He joined the law Firm of Adegboyega Awomolo & Co in 1983 and rose to become a partner before he left to found his own law firm in June 1994. He is the Principal and Founder of the Law Firm, Yusuf O. Ali & Co, Ghalib Chambers, with offices at ILORIN, Lagos and Abuja with Ilorin as the head office . Commonwealth Lawyers Association; among others. Fellow of the Chartered Institute of Arbitrators, (FCIArb) (UK). Fellow Society for Peace Studies and Practice (FSPSP). Honourary Fellow, Nigerian Minning And Geosciences Society. Pioneer Chairman of the NBA Anti-corruption Commission. News Letter Editor International Bar Association Committee on Damages and Negligence. Member of Council, Commonwealth Lawyers Association. Member Legal Practitioners Disciplinary Committee of the Body of Benchers. He is the Vice Chairman of the International Bar Association committee on Damages and Negligence. He is a member of the NBA ILORIN Council of Elders. He was co opted into the Council of the University of ILORIN in 1995 to probe the bursary of that university. He is a member of the Board of Trustees of the ILORIN Central Mosque. Chairman Alanu Trust Fund of the University of Ilorin Teaching Hospital. Mr. Yusuf Ali SAN is a Patron and Legal Adviser to many professional and socio cultural groups all over Nigeria. He is also an Associate Lecturer, at the Faculty of Law, University of Ilorin. He has delivered more than Two Hundred papers on different and diverse topics at various foray, including the International Bar Association Conferences, Commonwealth Law Association conferences , Annual Conferences of the Nigerian Bar Association, among others. He had contributed more than 17 Chapters to various legal books and has to his credit more than 40 published learned articles in learned journals in the field of litigation, Commercial Law, jurisprudence , practice and procedure, constitutional law in local and international law journals. He had represented many state governments, high net worth Individuals, Corporate and Institutional Clients before all the superior courts of record from the high court to the Supreme Court in many landmark cases. Yusuf Ali has been awarded more than 100 honours from within and outside of Nigeria. He is listed in the American Biograhical Institute's Who is Who, as well as in Nigeria's Who is Who. Award of Excellence by the National Association of Muslim Law Students, National Headquarters, Abuja. Commander of Great IFE , (COI) by the OBAFEMI Awolowo university national Alumni. Honorary Degree of Doctor Of Letters (Honoris Causa) of Al HIKMA University . A Twin Dormitary to the University of ILORIN. An Eighty bed Hostel to the OSUN State University. A Ten Bed Advanced Trauma Centre to the University of ILORIN Teaching Hospital. Thirty unit ICT center to the Faculty of Law OBAFEMI Awolowo university ILE IFE. Thirty unit ICT center to the College of Law, Crescent University ABEOKUTA OGUN state. Endowment of the Crescent University College of Law Building. Forty unit ICT center to the KWARA state polytechnic , ILORIN. A brand new Kia Rio 2014 Model to the University of Ibadan for the use of the Department of Arabic and Islamic Studies of the university. In the recent past, in order to enhance the work of the KWARA state police command, he donated a well equipped patrol van and some units of motorcycles . The Yusuf Ali Foundation does a lot of other charity work like award of scholarships to indigent students in secondary and tertiary institutions both in Nigeria and outside, provision of wells and boreholes to communities, medical financial assistance to patients both within the country and outside and the development of literary awareness in secondary schools all over the country by entering into an annual sponsorship with the Association of Nigerian Authors. Yusuf Ali is a well travelled man and has visited all the continents of the world for professional and educational purposes. He has published many learned articles in learned journal and contributed chapters to many books.